The Maures Massif is one of the oldest and wildest landscapes in Provence. Huddled at the bottom or clinging on to its sides, 26 villages share its benefits. From Hyères to Fréjus, it stretches over almost 60km, i.e. almost a quarter of the department, of which a large part is on the coast. Covered in cork oak and chestnut trees, ‘Les Maures’ offers a wide range of landscapes for hiking and horse-riding. Discover real gems, such as the magnificent Chartreuse de la Verne, or the charming villages of La Garde-Freinet and Collobrières. The views over the Iles d’Or and the Giens peninsula from the sanctuary of Notre-Dame des Anges are outstanding. For a long time, the economy was built around cork and chestnuts. Today, chestnuts are still an important part of daily life in some villages: local produce, craftsmanship and local festivals. Don’t miss the Chestnut Festivals in Collobrières, Mayons, Gonfaron, La Garde-Freinet and Pignans. 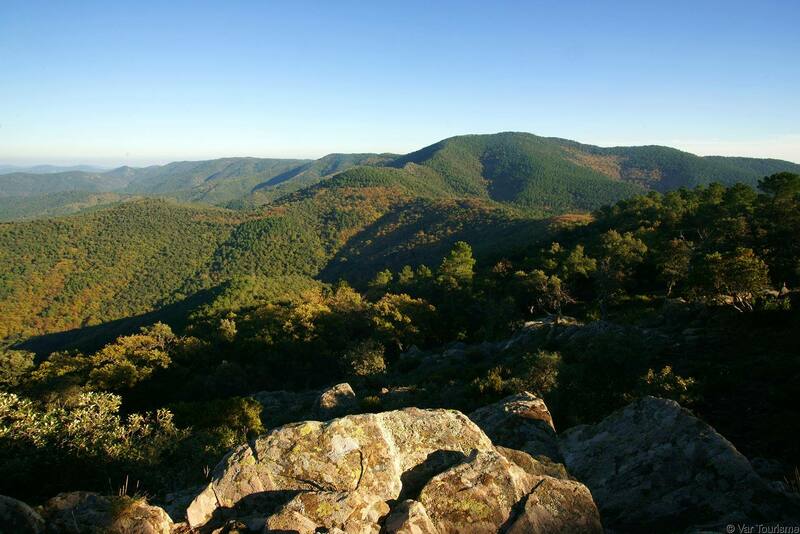 At the bottom of the inland mountains are The Maures plain, a National Nature Reserve, the last wild plain in the Var. With its red porphyry rock, the Estérel Massif has a unique appearance. Rising up between Saint-Raphaël (83) and Mandelieu (06), the unspoiled landscapes are magnificent: a line of sheer, narrow gorges and ragged crests. Striking against the azure blue sky, it majestically overlooks the Mediterranean, certainly for better diving into the marine-blue sea. 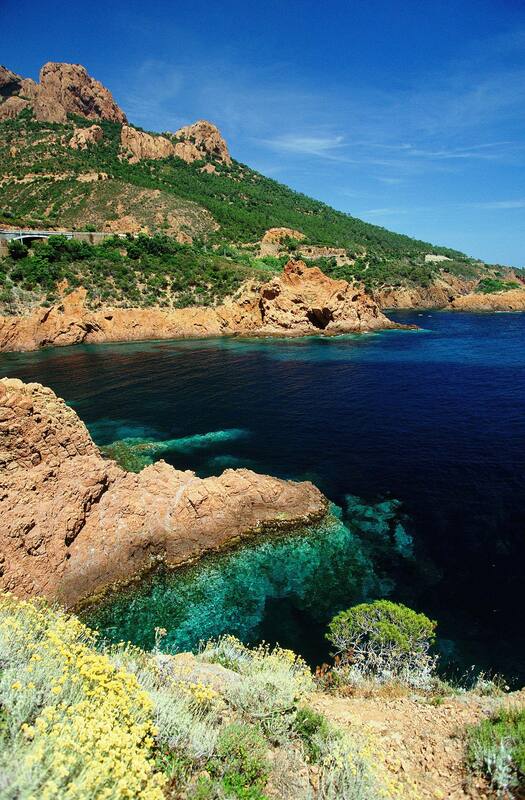 The most spectacular part of the coast is the peak of the Cap Roux, where the rock hurtles down 452m into the sea. The flora is rich and diverse. Despite forest fires, pine, chestnut, hornbeam, fig and olive trees grow in abundance, rubbing shoulders with palm trees, mimosa, eucalyptus and imported tropical plants that are thriving thanks to the mild climate. Criss-crossed by numerous hiking trails, it is a wonderful place for hiking or biking. Visitors can also explore the rocky inlets from the sea, in a boat or canoe trip. At the bottom of the mountains is the ‘Corniche d’Or’, named thus for the beauty of its surroundings. The carved coastline provides beaches and small coves. The miniscule ‘Ile d’Or’ contains a strange tower built in the 19th century by an odd fellow who claimed to be the King of the Island. The tower also inspired Hergé for the cover of a famous comic: Tintin! It looks like a limestone wall rising over 1100m high and stretching west for almost 14km! This impressive rocky barrier gets its name from a cave (‘baumo’ in Spanish) where Saint Mary Magdalene supposedly lived at the end of her life. This cave, made into a sacred place in the 13th century, is one of the most popular pilgrimage destinations in the world: at least 8 popes and 18 monarchs have come here since the Middle Ages amongst the crowds of anonymous pilgrims. Therefore, Sainte Baume is considered, alongside Saint Victoria and Mont Ventoux, as one of the ‘sacred’ mountains of Provence. Take the ‘Chemin des Rois’ to climb to the cave, or one of numerous paths through the mountains, including the Way of Saint James. From the Pic de Bertagne or Saint-Pilon, the views are simply breath-taking. The Massif is covered in an ancient forest (a survivor of the last Ice Age! ), containing unusually long-lived species, almost a thousand years old. These ancient trees are home to an unparalleled diversity of wildlife. 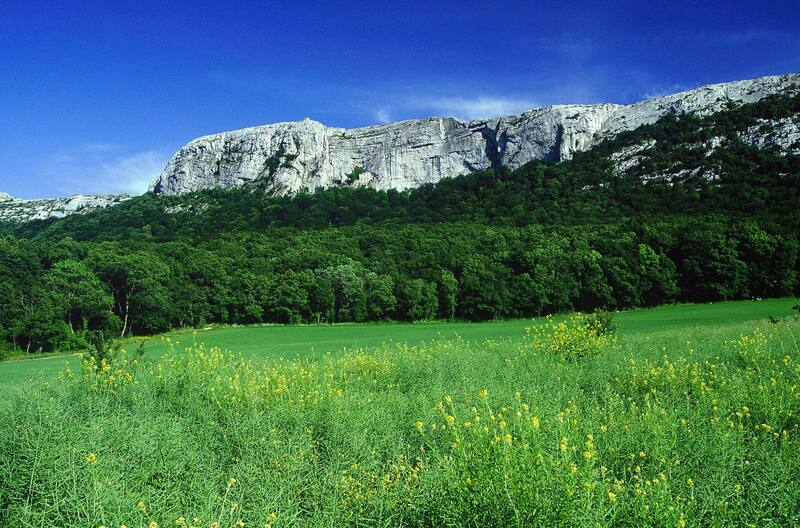 In order to protect it, the Sainte Baume Regional Natural Park is currently being created.